The horrors of war compounded by the horrors of insanity, the fragile promise of family ripped apart by a larger conflict, the struggle for life amongst so much death, the creative sensibility battered by an overwhelming destructive force, such is the stuff of Behind the Crooked Cross, the latest comic from Australian creator Frank Candiloro. This book takes Candiloro’s usual fascination with the horror comic genre to a whole new level, mixing it with profound tragedy and simple heartbreak. Behind the Crooked Cross is, for all intents and purposes, a World War II story. Set in Poland in 1942, it follows the story of a Polish artist named Matylda who values, above all else, the community and comfort, the love and the nurturing, that the concept of family provides. But in Behind the Crooked Cross these familial bonds are broken time and time again by death, to the point where it is eventually death itself that becomes family, and it is in its final embrace that Matylda is at last able to find a complete and lasting solace. To this point, Candiloro quotes Hermann Hesse in the back of this book: “The call of death is a call of love. Death can be sweet if we answer it in the affirmative, if we accept it as one of the great eternal forms of life and transformation.” In a world torn apart by war, by genocide, and by chaos, all that is left to welcome is death. Still, though, every death in this book is the result of savagery and only the insane are able to embrace it. There is nothing glorious in these deaths. This is our human failing. Candiloro explores his themes as thickly as he spreads the black ink on his pages. These could be German Expressionist woodcuts. Strong images. Highly defined. Bold opaque lines. 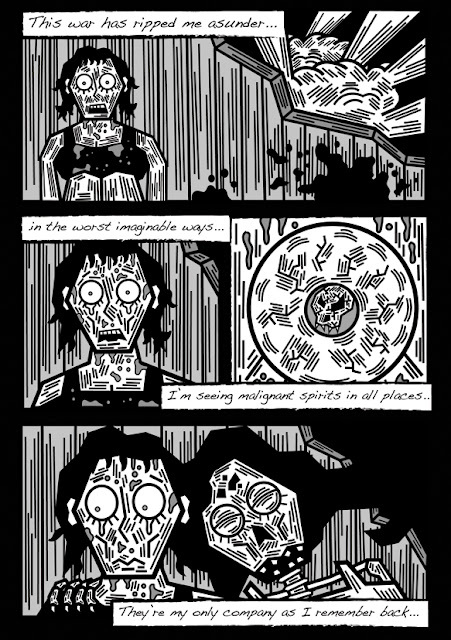 This is a horror comic and Candiloro’s art only add to that sensibility. 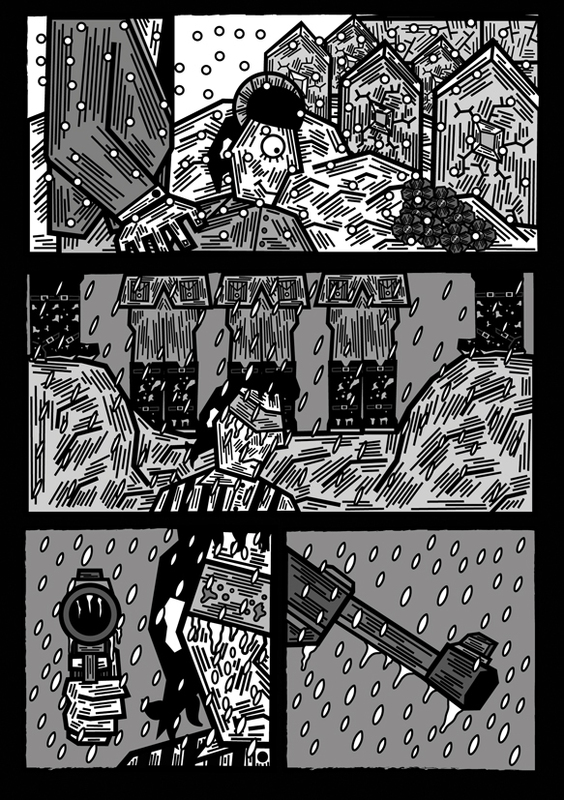 His blocky and angular style layers the levels of despair and disassociation simply, perfectly. The audience struggles to connect to Matylda as Candiloro’s rendering keeps her at bay. As the story unfolds, though, the lines and the shading and the bold panel delineations combine in a complex way to bring about the universality of the subject. By abstracting, by using a more primal, almost Aboriginal art style, Candiloro brings the audience into the mix. 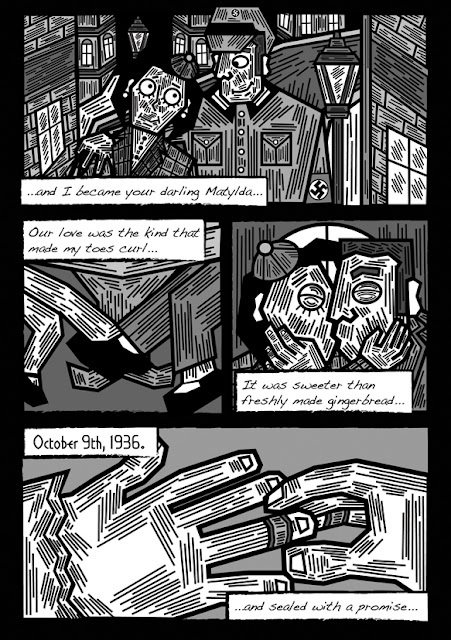 Through this, the viewer is forced to participate actively in creating meaning from their previous experience, and Candiloro uses this to his advantage to build the emotional impact of the horror his story unfolds. And this story is horrific. Each page brings about a new atrocity, a new repugnance. 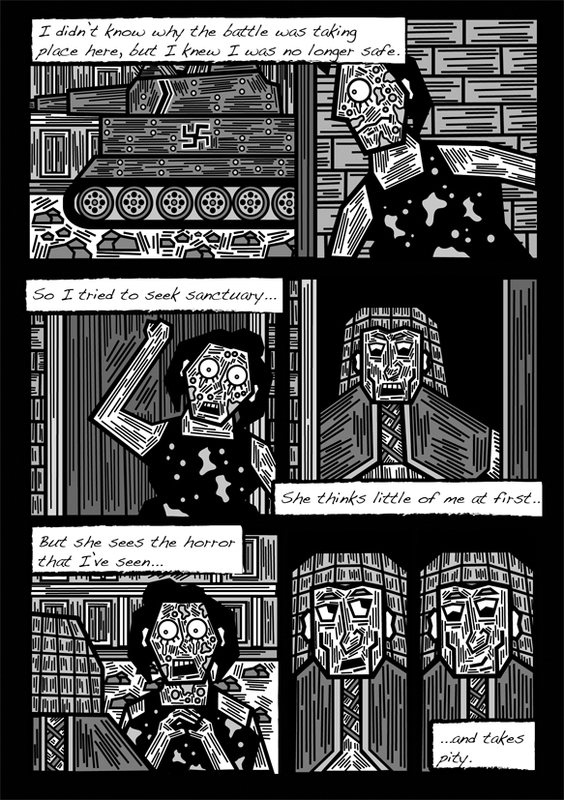 As much a commentary on Nazi atrocities as it is a polemic on the fragility of the creative spirit, ultimately in Behind the Crooked Cross Candiloro sees the individual as constantly searching for connections to bring him or her a sense of belonging, as much as engendering a sense of self. There is a circuitous nature to his story, and within that structure is perhaps his greatest commentary: an expression of faith that in the future the crooked cross can be straightened and, in that, we move forward out of the horror and into ourselves. 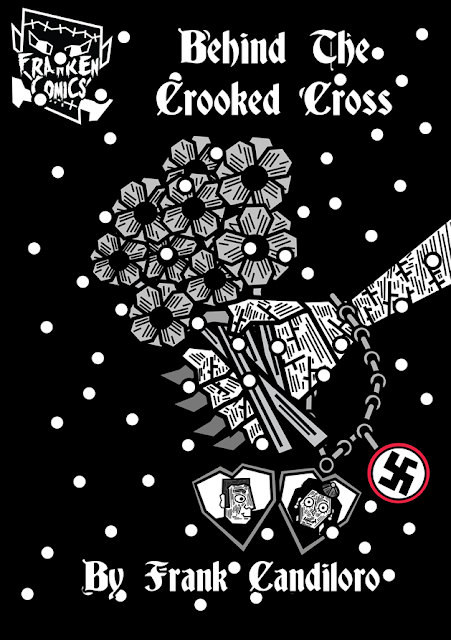 Behind the Crooked Cross is available for purchase from Frank Candiloro’s website.